Global Travel News: Tired of traditional resorts, or are you just looking around for an unusual place to sleep? Tired of traditional resorts, or are you just looking around for an unusual place to sleep? 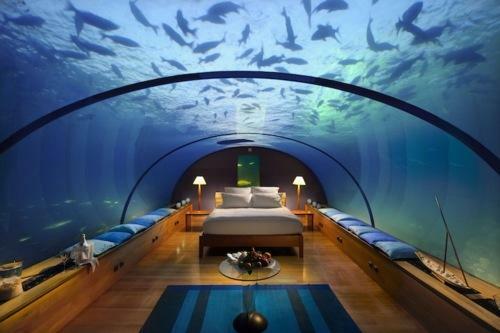 You should try one of these underwater hotels! Located in a Fijian lagoon, this resort is being built 40 feet underwater. Accessible by elevator, and fully pressurized, you’ll be able to spend 2 nights underwater, including various activities such as relaxing marine-focused spa treatments, swinging on a hammock built for two, or meditating under the gaze of only the moon and stars. You can find several restaurants and bars; a dive shop, water sports center and retail boutique, or you could just enjoy the library lounge, the theater area or the conference room. On the island beneath you’ll also find a nine-hole golf course, tennis courts, swimming pools and health clubs. Located in Key Largo, Florida, it was opened 1986. The front door is located less than 21 feet under water, so don’t worry you won’t need the scuba certification! Previously used as a marine lab, the lodge features a 2 bedroom 1 bath retreat that can be rented for a night or more. In the bedroom is a 42inch round window, so you’ll wake up with a view at the maritime life. The hotel also offers a scuba diving school. If you want to, you can stay a couple of days without even going to the surface. At day time you can take some scuba diving course and pass different diving certifications, or just dive around in the emerald lagoon in the company of their instructor. Wow! 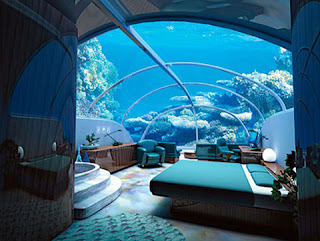 This place looks really cool, but the fact that you are sleeping under 100 tonnes of water puts me off! I hope that one day they will have the same but in space! It would be so awesome to spend a week in space (well you can but it is too expensive and traveling in a Soyuz is not the kind of holidays I would imagine). Imagine waking up in space with a view on Earth... Later a space walk... well don't think about things like lunch and shower, this must be complicated. Amazing I cant imagine how that place might have been built 40 feet under water. The best of it that there are fishes in that water. That will look like that you in the water as well with the fishes. The Madeira nature is unique in the world. I suggest booking 2 or 3 different Holiday Apartments or Holiday Cottages in different locations of Madeira Island. Here you can find Madeira Island Countryside Accommodation all around the Island. Madeira Rural offers a wide selection of Countryside accommodations strategically located around the island and close to some Levada Walks and Footpaths that will allow you to discover the fantastic Natural World of Madeira Island!